Rococo Systems & Designs are one of the UK’s leading providers of Linn. Linn Hi-Fi systems use the latest technology to offer incredibly high definition sound throughout your home. We have been an appointed Linn specialist for over thirty years, and are proud to announce the new Linn Kilmax Music System. The newest addition to our extensive range combines all of the impressive Linn features, rolled into one sleek and elegant package. This complete integrated system offers sound quality beyond compare, using the Katalyst DAC Architecture. This technology ensures that your music has a high-stability input reference level, creating the clearest sound possible. If you already own a pair of Linn Klimax 350 speakers you can also upgrade your speakers with this latest technology. The system can play incredibly high quality music throughout your full home, working with your phone, home network or the cloud. All products, including the new Klimax System are all available to try before you buy. You can pay us a visit at our London or Essex offices, or you can try one in the comfort of your own home. Rococo Systems provide extensive customer service for their clients, we pride ourselves on being one of the few companies to offer installation of Linn products. We understand that choosing a home sound system can be difficult. Our team of experts offer home visits to help you choose the best products for your surroundings. We also offer free specialist repairs within the warranty, and continued services at a charge. 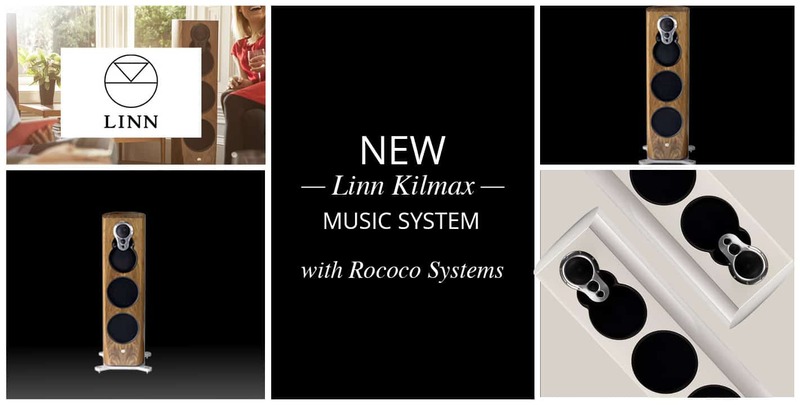 If you are interested in the new Linn Klimax Music System, or any of our other products, please contact Rococo Systems & Designs online today. Alternatively you can call our London office on 020 7454 1234 or our Essex office on 01277 890 888.